When we choose to follow Christ in faith rather than choosing another path out of fear, we are blessed with a consequence that is consistent with our choice. 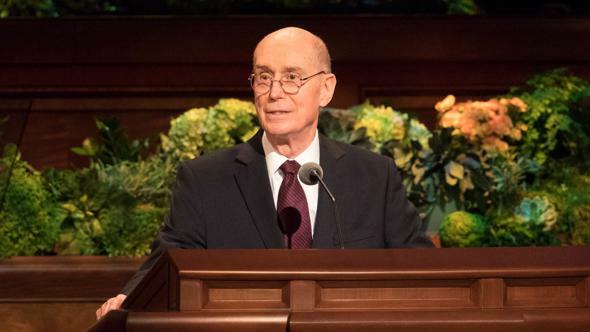 Dear brothers and sisters, I join with you in expressing my love and sustaining support to President Eyring and his family. President Hinckley extended this call to serve in the Quorum of the Twelve late Thursday afternoon. I cannot possibly articulate the kaleidoscope of feelings I have experienced since then. There have been sleepless nights and much prayer. 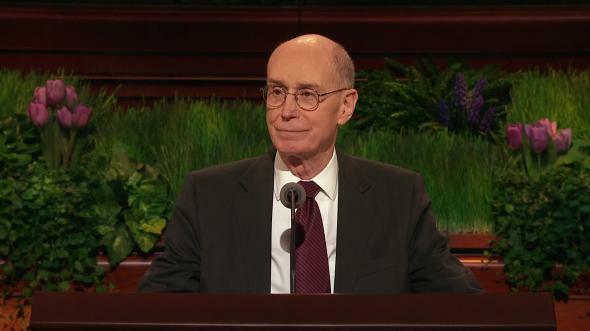 My spirits have been buoyed, however, by the knowledge that President Hinckley is the prophet and that the membership of the Church will be praying for me and my family. To say that I feel deeply inadequate would be an understatement. When I was called as a General Authority in April of 1996, I also felt unequal to the calling. 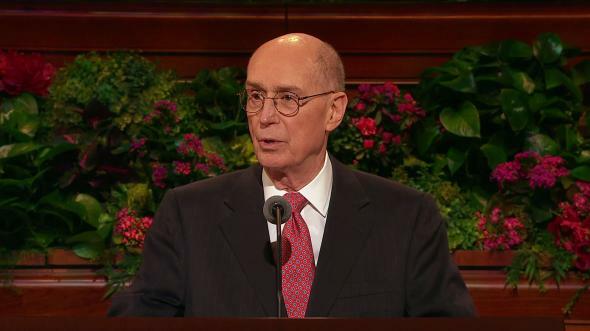 Elder Neal A. Maxwell reassured me then that the most important qualification for all of us serving in the kingdom is to be comfortable in bearing witness of the divinity of the Savior. 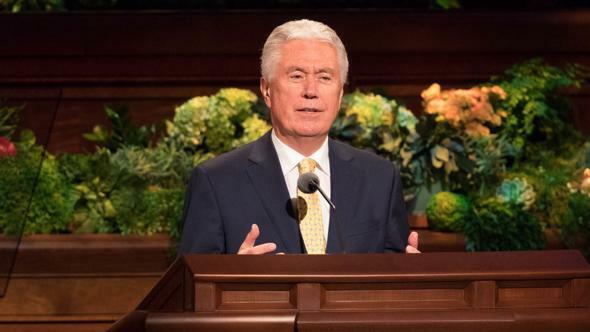 A peace came over me at that time and has stayed with me since because I love the Savior and have had spiritual experiences that allow me to testify of Him. I rejoice in the opportunity to bear witness of Jesus Christ in all the world (see D&C 107:23), notwithstanding my inadequacies. “Behold, this is the promise of the Lord unto you, O ye my servants. I seek the companionship of the Holy Ghost as I speak with you this Sabbath morning. “For God hath not given us the spirit of fear; but of power, and of love, and of a sound mind” (2 Timothy 1:7). In my own case, I respectfully acknowledge ancestors now on the other side of the veil who gave everything asked of them to build the kingdom of God upon the earth. I am grateful that all my life I have been surrounded by those who love the Savior. My heart is full of appreciation for my family. My wife, Mary, has been the joy of my life. Her spiritual strength, righteous example, sense of humor, and loving support have blessed me throughout my life. Our three children and their spouses have been sources of great personal satisfaction and, together with our nine grandchildren, have been such a blessing to us. Their faith and prayers and the goodness of their lives have been a great comfort to Mary and me. When I think back to my youth in Logan, Utah (Elder Perry’s fabled Cache Valley), I realize how fortunate I was to be reared in a goodly home—to have a righteous mother who was full of faith, a loving father, an older brother who has been an extraordinary example to me as well as a friend and counselor, and a younger sister who has been loving and supportive. How fortunate also to have had talented and devoted Church leaders, teachers, coaches, and friends who were wonderful examples to me. 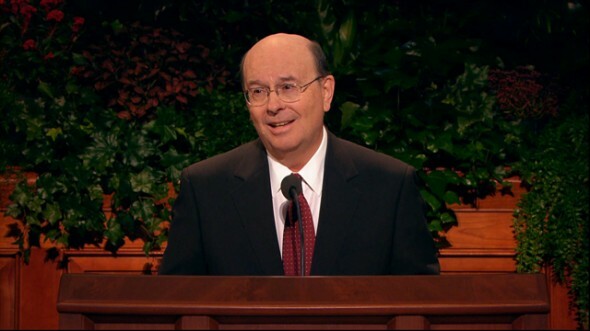 As a young man I had the opportunity to serve in the British Mission, which was a seminal, defining event in my life. 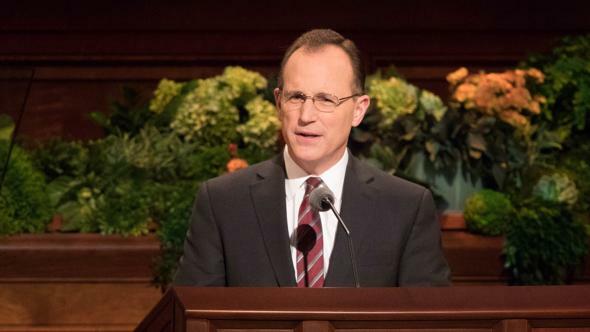 The influence of a valiant mission president is one of the great miracles of the restored gospel. A few weeks ago, I received a birthday card at Church headquarters from a woman I helped teach in Gloucester, England, many years ago. I had lost contact with her. She informed me that she and her husband are both very active members and have 6 children and 20 grandchildren, all born in the covenant. It may be the best birthday card I have ever received. Mary and I left Utah so I could attend law school in Palo Alto, California. We were planning to return to Utah after graduation, but the Spirit directed that we stay in California. We lived in California for 33 years and raised our family there. We both had many opportunities to serve. We loved the diversity of the members and their commitment to the gospel of Jesus Christ. I will be eternally grateful for the wonderful Latter-day Saints in California who have been such a positive influence in my life. These last 11 1/2 years of service as a Seventy have been truly rewarding ones. 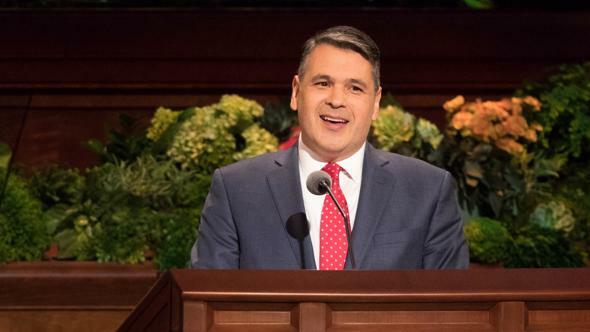 As I leave that quorum, I want my fellow Brethren to know of my love and appreciation for their dedication and loyalty to the kingdom of God on the earth—for their faithfulness and good works. I want them to know of the joy it has been to serve with them. I love the Brethren we sustain as prophets, seers, and revelators with all my heart. I’ve tried to serve honorably and lighten their responsibilities in any way I could. I’m grateful to the First Presidency and Quorum of the Twelve for their lives of goodness and example, their patience, their teaching, their kindness, their devotion to our Heavenly Father and His Son, Jesus Christ, and His restored gospel. I am grateful that God called Joseph Smith to be a prophet through whom the fulness of the gospel was restored to earth. 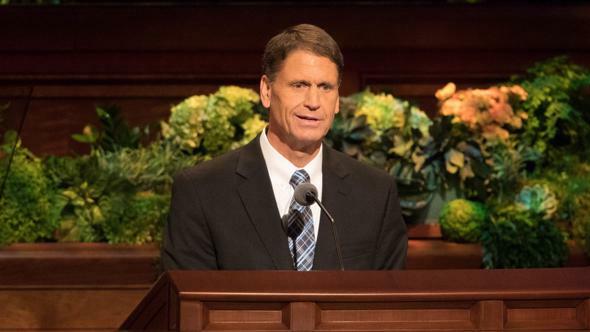 My experience as a General Authority has filled my heart with appreciation for the faith and goodness of the Latter-day Saints all over the world. We served for two years in the Philippines. In April of 1961, President Hinckley, then an Assistant to the Twelve, sent the first missionaries to Manila. There was only one Filipino priesthood holder in the Philippines. Today there are almost 600,000 members. Their lives are not easy, and they lack many material things, but they love the Savior. The gospel is having a tremendous impact in improving their lives. What a blessing to serve in their midst. We also served for three years in the Pacific Islands. It is significant that almost 25 percent of all the Polynesians in the world are members of the Church. Their faith and spirituality are legendary. Sister Cook and I were in Vava‘u in the Tongan islands on one occasion. I had just spoken about following the prophet in the general session of stake conference. At the luncheon following the conference, I sat next to a distinguished elderly patriarch. He indicated how grateful he was to hear what the prophet was teaching. He gave me the following account. Vava‘u, which is a relatively small island, usually has sufficient rain, but periodically there are severe droughts. The island has long inlets or bays, almost like sounds, which curl into the island below steep hills. When drought conditions left the village without water, there was only one way they could obtain fresh water and stay alive. Over the centuries they had found that fresh water traveled down through rock formations inside the mountains and came up in a few spots in the sea. The Tongan men would set off in their small boats with a wise elder standing at one end of the boat looking for just the right spot. The strong young men in the boat stood ready with containers to dive deep into the seawater. When they reached the appropriate spot, the wise man would raise both arms to heaven. That was the signal. The strong young men would dive off the boat as deep as they could and fill the containers with fresh springwater. This old patriarch likened this lifesaving tradition to the living waters of the gospel of Jesus Christ and the wise man to God’s prophet here on earth. He noted that the water was pure, fresh, and, in their drought condition, lifesaving. But it was not easy to find. It was not visible to the untrained eye. This patriarch wanted to know everything the prophet was teaching. We live in a precarious time. The world is in desperate need of the fresh springwater, which is the gospel of Jesus Christ. 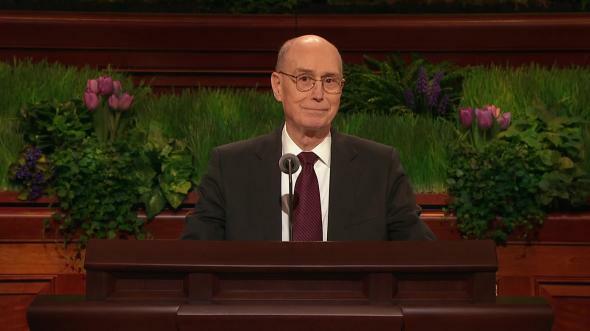 We should listen intently to the prophet as we make choices. My own informal records indicate that President Hinckley has continually emphasized faith in the Lord Jesus Christ. That has been followed by his emphasis on strengthening families and having family religious observance in the home. Over and over again he has told us that if we would live a principle, we would gain a testimony of the truthfulness of that principle, which would in turn increase our faith. Create the true spirit of the gospel in our hearts and homes. Be a light to those among whom we live. As we followed this counsel, our faith increased and our fears decreased. I believe we can raise righteous children anywhere in the world if they are taught religious principles in the home. One area where members can live by faith and not by fear is in our missionary effort. 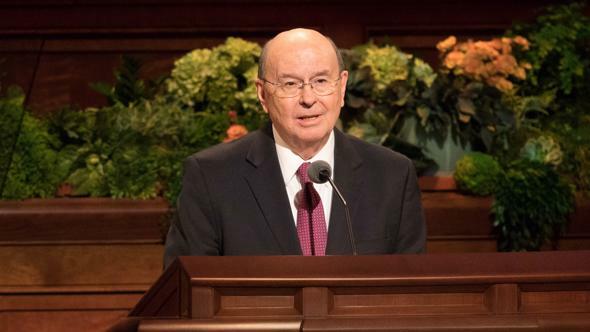 Prior to my call to the Presidency of the Seventy on August 1 of this year, I had served in the Missionary Department for six years, the last three years as Executive Director under Elder M. Russell Ballard, who served as Chairman of the Missionary Executive Council. “How beautiful are the feet of them that preach the gospel of peace, and bring glad tidings” (see also Isaiah 52:7). It has been observed that the members are going to have to move their feet and let their voices be heard if they are to achieve this blessing. Preach My Gospel: A Guide to Missionary Service was first introduced in October 2004. President Hinckley commenced this effort when he called for missionaries to learn the doctrine and to teach the principles by the Spirit. Every member of the First Presidency and Quorum of the Twelve participated to a significant degree. Elder Ballard and I felt that the windows of heaven were opened and the Lord’s inspiration poured out to bring forth this great resource. Over 1.5 million copies of Preach My Gospel have been acquired by the members of the Church. It is a wonderful foundation, and the missionaries are powerful, spiritual teachers. However, if we are to accomplish what President Hinckley has requested, the members, living by faith and not by fear, need to share the gospel with their friends and associates. In our individual callings we need to have faith and not be fearful. Our daughter, Kathryn, is serving as the Primary president in her ward in Salt Lake City. My wife and I attended her ward last Sunday to observe the Primary sacrament meeting presentation, “I’ll Follow Him in Faith.” I was thrilled to hear the children recite scriptures and stories coupled with songs focused on faith in Christ. After the meeting, I asked her about her calling. She said that initially the calling weighed her down. Much time was spent going over problems. Then the presidency decided to emphasize love, faith, and prayer. Suddenly spiritual impressions came to mind about a particular child or family. Friction was replaced with love. She tells me that as they acted upon promptings from the Spirit, Primary reflected a reverence and peace, and real gospel learning was taking place. It is our faith in Jesus Christ that sustains us at the crossroads of life’s journey. It is the first principle of the gospel. Without it we will spin our wheels at the intersection, spending our precious time but getting nowhere. It is Christ who offers the invitation to follow Him, to give Him our burden, and to carry His yoke, “for [His] yoke is easy, and [His] burden is light” (Matthew 11:30). There is no other name under heaven whereby man can be saved (see Acts 4:12). We must take upon us His name and receive His image in our countenance so that when He comes we will be more like Him (see 1 John 3:2; Alma 5:14). When we choose to follow Christ in faith rather than choosing another path out of fear, we are blessed with a consequence that is consistent with our choice (see D&C 6:34–36). May we all recognize and give thanks for the incomparable gift of life we each enjoy and for the breath that He lends us daily. May we choose to have conviction at the crossroads of life and exercise faith in Jesus Christ. My prayer is that we will live by faith and not by fear. I bear my witness of God, who is our Heavenly Father, and His Son, Jesus Christ, who atoned for our sins, in the name of Jesus Christ, amen.